Carla Gannis has exhibited in solo and group art exhibitions nationally and internationally. Her solo exhibitions include “The Multiversal Hippozoonomadon & Prismenagerie” at Pablo’s Birthday Gallery, New York, NY; “The Non-Facial Recognition Project” at Edelman Gallery, New York, NY; and “Jezebel” at The Boulder Museum of Art, Boulder, CO. Gannis is the recipient of several awards, including a 2005 New York Foundation for the Arts (NYFA) Grant in Computer Arts, an Emerge 7 Fellowship from the Aljira Art Center, and a Chashama AREA Visual Arts Studio Award. Features on Gannis’s work have appeared in Art Critical, NY Arts Magazine, Animal Magazine, and Collezioni Edge, and her work has been reviewed in The New York Times, The Los Angeles Times, The Daily News, and The Village Voice. 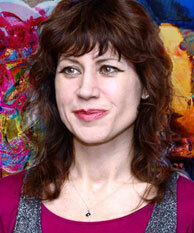 Gannis holds an MFA in Painting from Boston University and is Assistant Chair of Digital Arts at Pratt Institute.